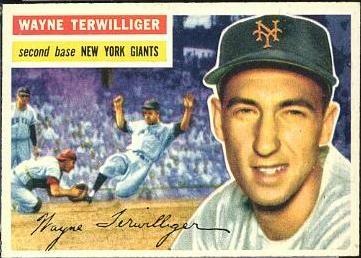 Willard Wayne Terwilliger was born on June 27, 1925 in Clare, Michigan. The tall lanky second baseman earned the nickname “Twig” because of his frame & his name. He played at West Michigan University getting signed by the Chicago Cubs in 1948. He spent two season with the Cubs, playing 133 games in 1950 hitting a career high 10 HRs with 32 RBIs and a .242 average. He was a fast infielder coming in sixth in steals that year (13) & had nine sacrifice hits (9th in the league). 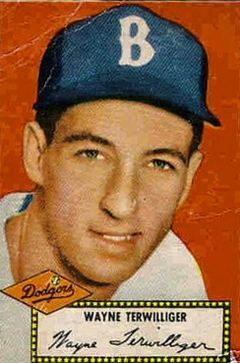 He spent a brief time with the Brooklyn Dodgers in 1951, although he hit .280 in 37 games he was placed on waivers. He was purchased by the Washington Senators, and after one season in the minors, became their regular second baseman for two seasons. He hit a career-high .252 with 24 doubles 46 RBIs 13 sac hits (6th in the league) and 64 walks, posting a .343 on base %. Defensively at second base, he posted the leagues fourth best fielding percentage (.983) was third in assists (393) & fifth in put outs. He was also among the league’s top five in errors made for the fourth time. He was purchased by the New York Giants after their 1954 Championship season, sharing time with Davey Williams at second base. 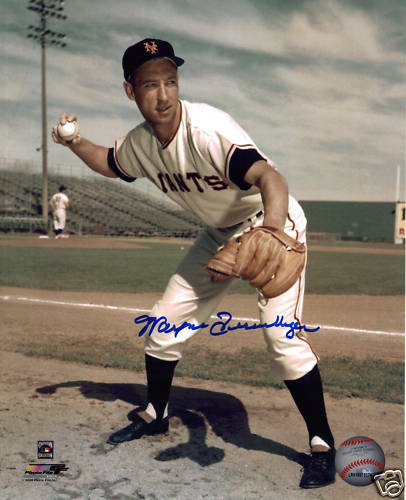 He led all NL second baseman in fielding percentage (.985) and hit .257 with a HR, 16 doubles & 18 RBIs in 80 games playing for the ’55 Giants. In 1956 he hit only .222 in 14 games & was sent down to the minors. He was traded just before the move to San Francisco, spending his last two playing seasons with the Kansas City A’s. He hit .with 240 lifetime in 666 games, with 22 HRs 93 doubles 162 RBIs & a .974 fielding percentage. After his playing days he coached with the Washington Senators under Ted Williams (1969-1971) the Texas Rangers (1972/ 1981-1985), & the Minnesota Twins (1986-1994) winning two World Series. He has also managed in the minor & Independent Leagues. After retiring he came back as a first base coach in 2008 in the Cental League. 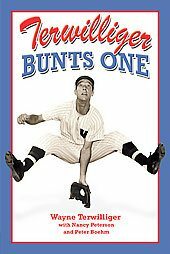 After 60 years in baseball he wrote an autobiography entitled: Terwilliger Bunts One.